Staff super prestável. Hostel limpo e moderno, recomendo. 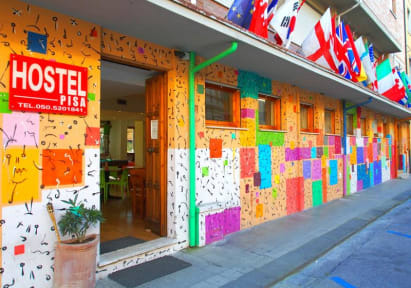 Great hostel, probably the best in Pisa. You can walk from the airport and also it's really close to the city center. Good rooms and great facilties overall. Definitely recommend this hostel for travellers. Gostei sobretudo do staff, ambiente e localização do hostel. Será sempre local a ficar se for a.pisa. Nice staff, clean room and bathroom, good food at cheap prices (ex. Dinner buffet for 7€). It's close to the train station but it takes 30min walking to the centre. The overall feel of the Hostel is great, specially when one gets to the hostel. The location is not bad. The room and bathroom are completely stripped of any time of decor which is uncomfortable as you don't feel at home at all. The staff is very helpful and nice and the garden and kitchen/eat-sit-drink area is comfy. 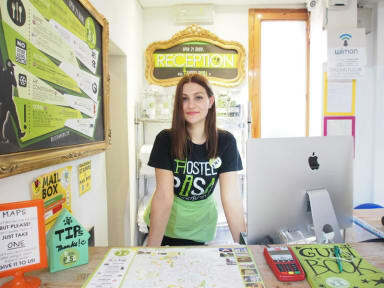 O hostel é bem localizado, possiveĺ ir ao aeroporto e ao centro de Pisa andando, os quartos sao limpos e possui refeição no local. A wi fi não pega direito nos quartos e o chuveiro nao esquenta muito. Os staffs sao ok.